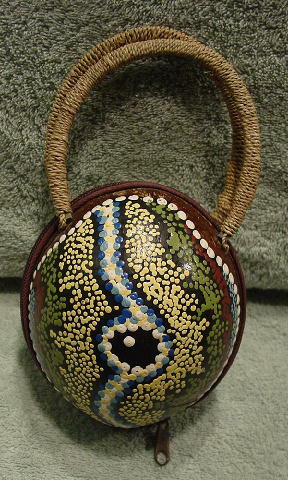 This never-used cute little handmade purse is actually a coconut which has been cut in half. An orange (floral design) fabric has been attached to the edges to form the interior closure to keep your keys, lipstick, etc. in place. There is a center 4 1/2" long zipper. 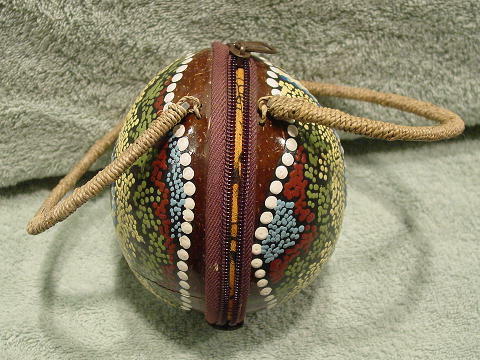 The interior halves of the coconut are not lined below the orange fabric. 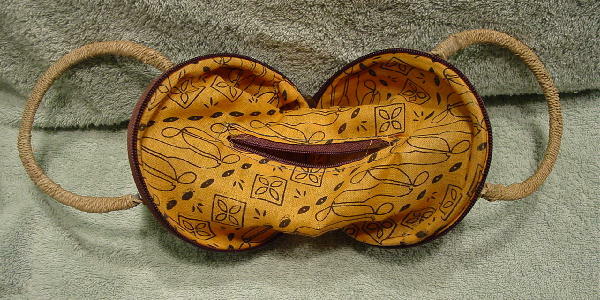 It has a 16 1/4: long brown exterior center zipper, and two 10" wrapped handles. The exterior is handpainted in freeform dots in pale yellow, reddish brown, baby and medium blue, white, Spanish olive green, and dark blue bordered in dark brown. It's definitely an unusual little purse and quite the conversation piece. Eden picked it up in London at a boutique.